Aoi Yuuki: moe of the grotesque. Aoi Yuuki has released, Meriba, her 2nd album. Many know her as a tremendously talented seiyuu, whose vocal range gives her the ability to play all kinds of characters. Personally I think her best role was Toshiko Tatsuno in Soredemo Machi wa Mawatteiru, because the role of the very unstable Tatsuno (aka Tattsuntsun) gave her the opportunity to use so much of her range. Aoi Yuuki with pink machine gun. When Aoi Yuuki used that surprising range on earlier work (notably on the track “Night Parade” from her first album, and “Incertitude”, a Gosick character song), the effect was something like Kate Bush, a wildly dramatic, and very expressive performance. For her second album, Yuuki has reigned the dramatics in, and the material is more predictable. 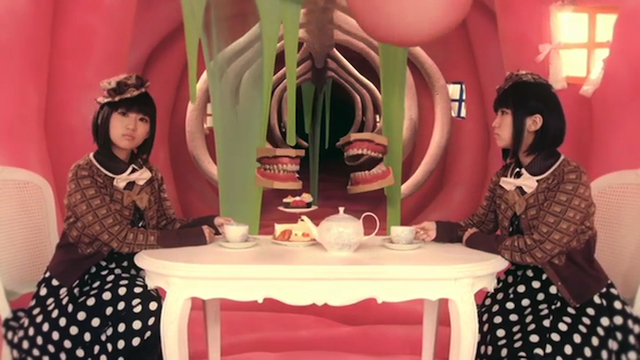 I rather like “Popon .. pon!”, and “Sanctuary Alice”, but the album doesn’t have the impact of her first album. If provided the right material, she could do some very interesting work. I’ve only found a link for a partial video for “Popon .. pon”, but here it is.